For more information about AWS Organizations, see our User Guide. In this blog post, I will walk you through some frequently asked questions related to Organizations in AWS GovCloud (US). Knowledge of the AWS GovCloud (US) Regions is helpful to understand the concepts introduced in this blog post. For more information about AWS GovCloud (US), see the AWS GovCloud (US) Documentation. For information about the differences between AWS GovCloud (US) Regions and standard AWS Regions, please see AWS GovCloud (US-West) Region Compared to Standard AWS Regions. 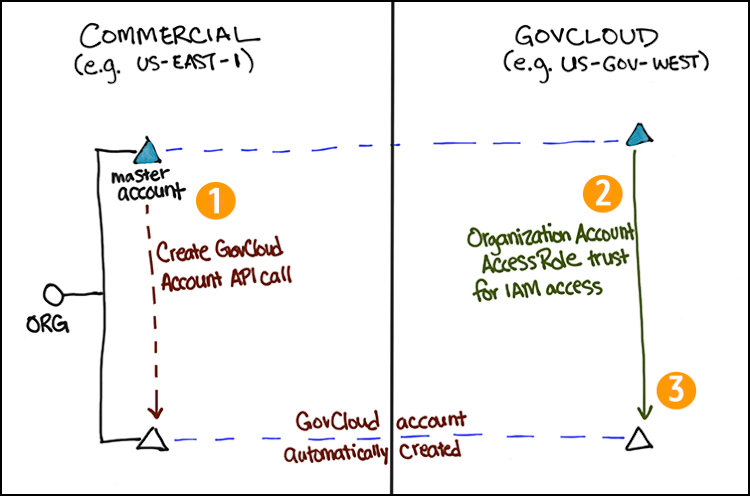 One fundamental concept is how AWS GovCloud (US) accounts work. 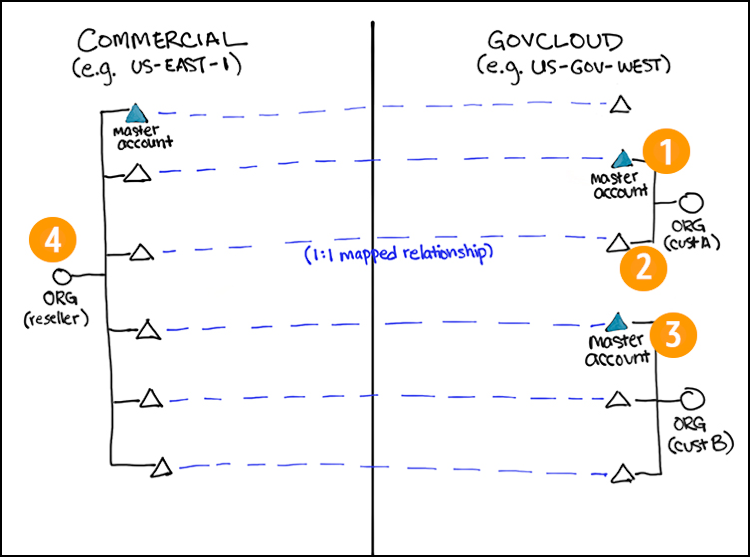 Each AWS GovCloud (US) account has a mapped commercial account associated with it in a 1:1 relationship (displayed in the diagrams later on in this blog post by blue dotted lines). The commercial account is used by the AWS GovCloud (US) account for billing and support-related use cases, as well as associating various account information for the AWS GovCloud (US) account (for example, an email address). This association between the AWS GovCloud (US) account and its mapped commercial account can’t be modified. The AWS GovCloud (US) Regions have special requirements, so you’ll need to have access to the AWS GovCloud (US) Regions to use AWS Organizations in AWS GovCloud (US). AWS GovCloud (US) organizations are completely separate from commercial organizations and are managed independently of one another. 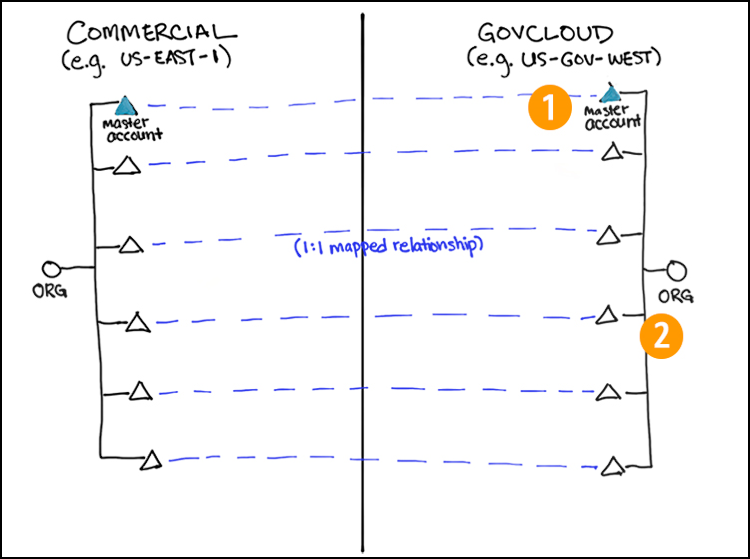 The two most common models used to structure your AWS GovCloud (US) organization in relation to an existing commercial organization are a single company model or a reseller/partner model. For single companies, you’ll want to use the AWS GovCloud (US) account mapped to your commercial organization master account to create your AWS GovCloud (US) organization. This maintains the relationship between the two organization’s master accounts for easier management. This is visualized in Figure 1. The AWS GovCloud (US) account mapped to the master account of the commercial organization is used to create an AWS GovCloud (US) organization. The other AWS GovCloud (US) accounts mapped to the member accounts of the commercial organization are invited into the new AWS GovCloud (US) organization. For resellers or partners who might be servicing multiple customers in AWS GovCloud (US) from a single commercial organization, you can create an AWS GovCloud (US) organization for each customer. In Figure 2, I assume that the commercial organization is being managed by the reseller who is servicing two customers, A and B. Customer A chooses one of their AWS GovCloud (US) accounts to become the master account of their AWS GovCloud (US) organization and uses it to create the organization. Customer A invites their other AWS GovCloud (US) accounts into their new AWS GovCloud (US) organization. Customer B does the same as Customer A. The reseller manages all of the mapped commercial accounts for billing and support purposes in the reseller’s commercial organization. Creating your organization in AWS GovCloud (US) follows the same process as in other regions either by using the API/CLI or logging in to the AWS GovCloud (US) Organizations console and choosing Create organization. For more information on creating an organization, please see Creating an Organization. Can I use my AWS GovCloud (US) organization to manage accounts in commercial Regions? No, Organizations in AWS GovCloud (US) do not enable you to manage accounts in commercial regions. You can use your organization in the AWS GovCloud (US) Regions to help you manage your AWS GovCloud (US) accounts. Your organization in AWS GovCloud (US) has no relation to your existing organization in commercial Regions and is independently managed. Can I view the relationship between an AWS GovCloud (US) account and its mapped commercial account? No. Because of the isolated nature of the AWS GovCloud (US) Regions, you will not be able to view any information (such as the account ID or email address) about the mapped commercial accounts associated with your AWS GovCloud (US) accounts managed in your AWS GovCloud (US) organization. You can view and manage information about your AWS GovCloud (US) accounts using your AWS GovCloud (US) organization, and your commercial accounts using your commercial organization. 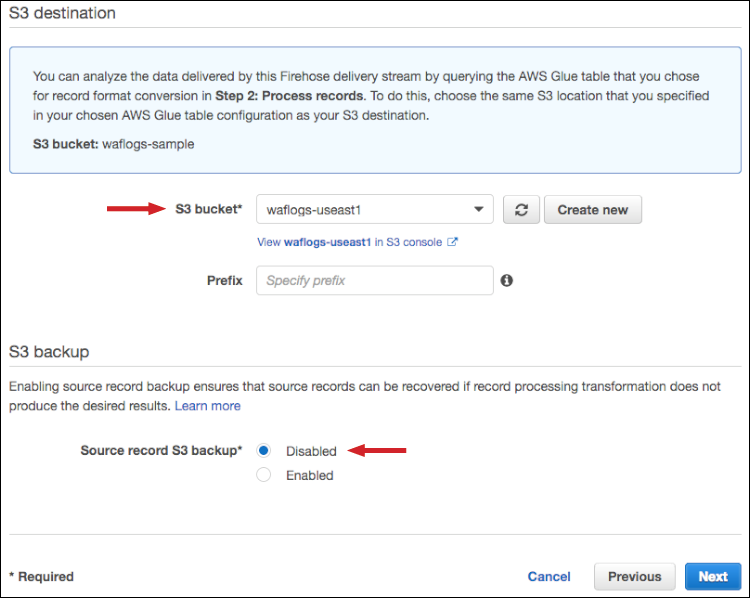 How does consolidated billing work for AWS GovCloud (US) organizations? AWS GovCloud (US) accounts are billed to the mapped commercial account associated with them and paid for in the commercial regions. Therefore, AWS GovCloud (US) organizations (and the master account of AWS GovCloud (US) organizations) are not responsible for the billing of account activity incurred by AWS GovCloud (US) accounts in the organization. If you manage all of your mapped commercial accounts associated with your AWS GovCloud (US) accounts in a single commercial organization—as you would if you follow the common configuration of a single company described earlier—you will receive one bill for all of your commercial and AWS GovCloud (US) account usage. How do I programmatically create a new AWS GovCloud (US) account using Organizations? New AWS GovCloud (US) accounts can be programmatically created using a new Organizations API, CreateGovCloudAccount, which can be called by the master account of a commercial organization, provided that it already has an associated AWS GovCloud (US) account. 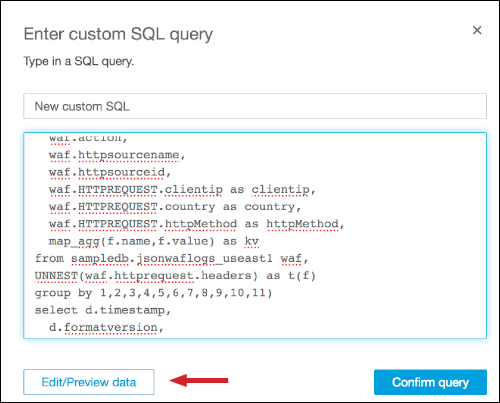 If your master account doesn’t have an associated AWS GovCloud (US) account, you’ll need to create one before using this API. The CreateGovCloudAccount API creates both a standalone AWS GovCloud (US) account as well as its corresponding mapped commercial account, which will automatically be added to your commercial organization. The new AWS GovCloud (US) account is independent and will need to be invited into an AWS GovCloud (US) organization. How do I access a new AWS GovCloud (US) account programmatically created using the CreateGovCloudAccount API? Use the commercial organization’s master account to call the CreateGovCloudAccount API, which creates a new account in the commercial organization. A role is created in this new commercial account that allows your commercial organization master account to assume it, the exact same way account creation works in commercial organizations today. A AWS GovCloud (US) account is then automatically created and mapped to the commercial account that was just created. A role is created in the new AWS GovCloud (US) account that can be assumed by the GovClAWS GovCloud (US)oud account mapped to the master account of the commercial organization. Sign in to the AWS GovCloud (US) account mapped to your commercial organization’s master account and assume the role into the newly created AWS GovCloud (US) account. Here’s a diagram to help you understand the process. You call the CreateGovCloudAccount API from the master account of your commercial organization, which creates a new account in your commercial organization and a mapped standalone AWS GovCloud (US) account. Your AWS GovCloud (US) account mapped to your master account of your commercial organization has permissions to assume the OrganizationAccountAccessRole IAM role in the newly created AWS GovCloud (US) account. Once you have access to the new AWS GovCloud (US) account, you can set up your own IAM users/roles and invite the account into your AWS GovCloud (US) organization. Can I manage both commercial accounts and GovCloAWS GovCloud (US)ud accounts using the same organization? No. You can use your existing commercial organization to manage your commercial accounts and create a new AWS GovCloud (US) organization to manage your AWS GovCloud (US) accounts. AWS Organizations now extends its governance and management capabilities to customers in the AWS GovCloud (US) Regions. Customers are now able add their AWS GovCloud (US) accounts in an AWS GovCloud (US) organization for central governance of access, compliance, and security. To get started, sign in to the AWS Organizations console from an AWS GovCloud (US) Region. If you have comments about this post, submit them in the “Comments” section below. If you have additional questions, please open a new thread on the AWS Organizations forum. Raymond is a Senior Technical Product Manager on the AWS Identity team covering AWS Organizations and Accounts. Outside of work, he enjoys taking care of his dog, Merlin, and volunteering with King County Search and Rescue. Now, using SCPs, you can specify Conditions, Resources, and NotAction to deny access across accounts in your organization or organizational unit. 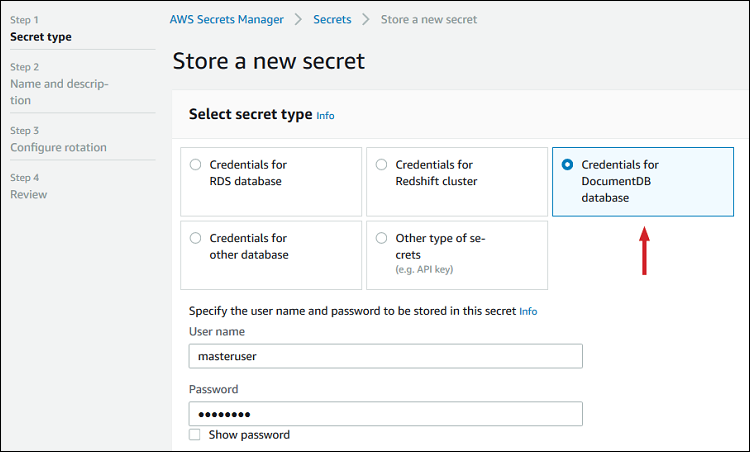 For example, you can use SCPs to restrict access to specific AWS Regions, or prevent your IAM principals from deleting common resources, such as an IAM role used for your central administrators. You can also define exceptions to your governance controls, restricting service actions for all IAM entities (users, roles, and root) in the account except a specific administrator role. To implement permission guardrails using SCPs, you can use the new policy editor in the AWS Organizations console. 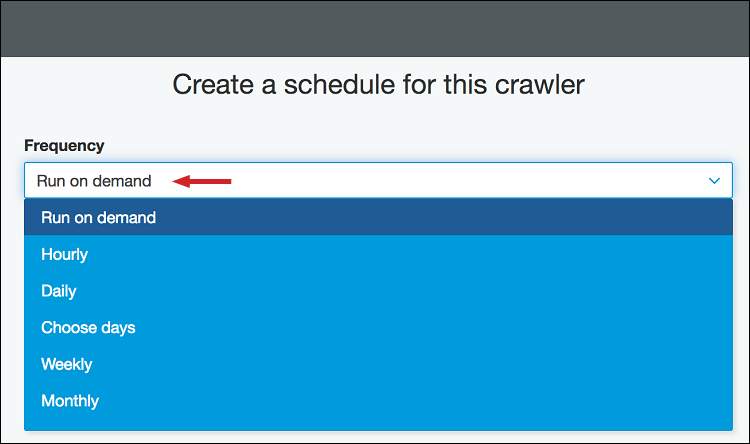 This editor makes it easier to author SCPs by guiding you to add actions, resources, and conditions. 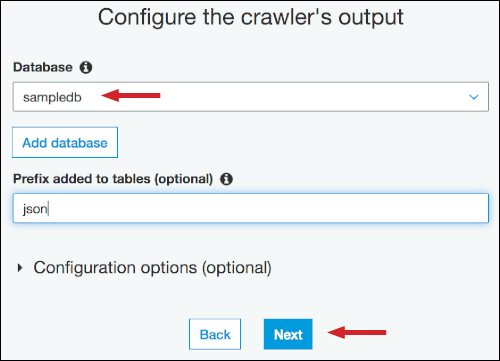 In this post, I review SCPs, walk through the new capabilities, and show how to construct an example SCP you can use in your organization today. Before I walk through some examples, I’ll review a few features of SCPs and AWS Organizations. SCPs offer central access controls for all IAM entities in your accounts. You can use them to enforce the permissions you want everyone in your business to follow. Using SCPs, you can give your developers more freedom to manage their own permissions because you know they can only operate within the boundaries you define. You create and apply SCPs through AWS Organizations. When you create an organization, AWS Organizations automatically creates a root, which forms the parent container for all the accounts in your organization. Inside the root, you can group accounts in your organization into organizational units (OUs) to simplify management of these accounts. You can create multiple OUs within a single organization, and you can create OUs within other OUs to form a hierarchical structure. 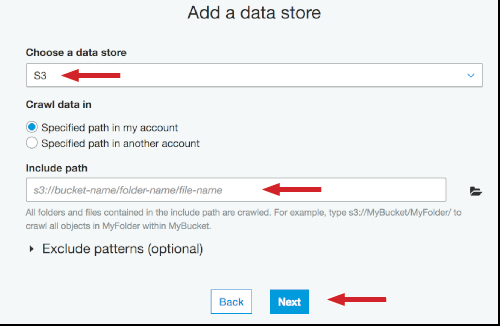 You can attach SCPs to the organization root, OUs, and individual accounts. SCPs attached to the root and OUs apply to all OUs and accounts inside of them. SCPs use the AWS Identity and Access Management (IAM) policy language; however, they do not grant permissions. SCPs enable you set permission guardrails by defining the maximum available permissions for IAM entities in an account. If a SCP denies an action for an account, none of the entities in the account can take that action, even if their IAM permissions allow them to do so. The guardrails set in SCPs apply to all IAM entities in the account, which include all users, roles, and the account root user. The table below summarizes the IAM policy language elements available in SCPs. You can read more about the different IAM policy elements in the IAM JSON Policy Reference. The Supported Statement Effect column describes the effect type you can use with each policy element in SCPs. Note: Some policy elements are only available in SCPs that deny actions. You can use the new policy elements in new or existing SCPs in your organization. In the next section, I use the new elements to create a SCP using the AWS Organizations console. In this section, you’ll create an SCP that restricts IAM principals in accounts from making changes to a common administrative IAM role created in all accounts in your organization. Imagine your central security team uses these roles to audit and make changes to AWS settings. For the purposes of this example, you have a role in all your accounts named AdminRole that has the AdministratorAccess managed policy attached to it. Using an SCP, you can restrict all IAM entities in the account from modifying AdminRole or its associated permissions. This helps you ensure this role is always available to your central security team. Here are the steps to create and attach this SCP. Ensure you’ve enabled all features in AWS Organizations and SCPs through the AWS Organizations console. 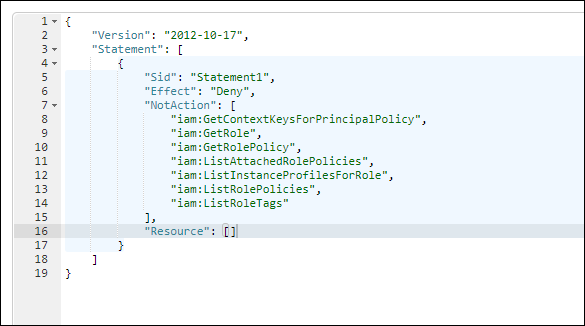 In the AWS Organizations console, select the Policies tab, and then select Create policy. Give your policy a name and description that will help you quickly identify it. For this example, I use the following name and description. Description: Prevents all IAM principals from making changes to AdminRole. The policy editor provides you with an empty statement in the text editor to get started. Position your cursor inside the policy statement. 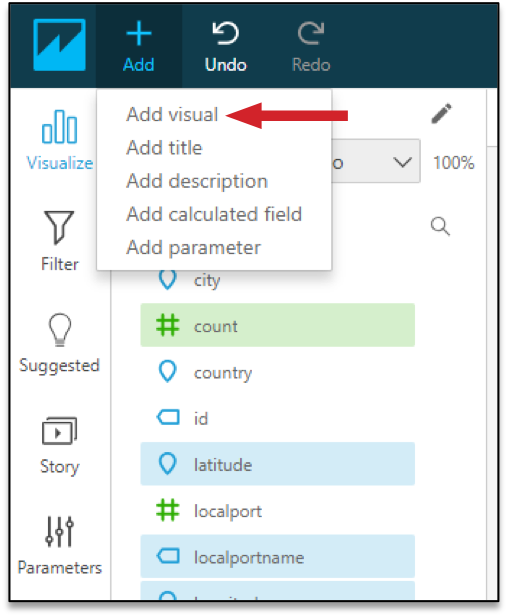 The editor detects the content of the policy statement you selected, and allows you to add relevant Actions, Resources, and Conditions to it using the left panel. Change the Statement ID to describe what the statement does. For this example, I reused the name of the policy, DenyChangesToAdminRole, because this policy has only one statement. Now position your cursor at the Action element and change it to NotAction. After you perform the steps above, your policy should look like the one below. Next, apply these controls to only the AdminRole role in your accounts. To do this, use the Resource policy element, which now allows you to provide specific resources. On the left, near the bottom, select the Add Resources button. In the prompt, select the IAM service from the dropdown menu. Select the role as the resource type, and then type “arn:aws:iam::*:role/AdminRole” in the resource ARN prompt. Note: The AdminRole has a common name in all accounts, but the account IDs will be different for each individual role. To simplify the policy statement, use the * wildcard in place of the account ID to account for all roles with this name regardless of the account. Select the Save changes button to create your policy. You can see the new policy in the Policies tab. Finally, attach the policy to the AWS account where you want to apply the permissions. When you attach the SCP, it prevents changes to the role’s configuration. The central security team that uses the role might want to make changes later on, so you may want to allow the role itself to modify the role’s configuration. I’ll demonstrate how to do this in the next section. In the previous section, you created a SCP that prevented all principals from modifying or deleting the AdminRole IAM role. Administrators from your central security team may need to make changes to this role in your organization, without lifting the protection of the SCP. In this next example, I build on the previous policy to show how to exclude the AdminRole from the SCP guardrail. In the AWS Organizations console, select the Policies tab, select the DenyChangesToAdminRole policy, and then select Policy editor. Select Add Condition. You’ll use the new Condition element of the policy, using the aws:PrincipalARN global condition key, to specify the role you want to exclude from the policy restrictions. The aws:PrincipalARN condition key returns the ARN of the principal making the request. You want to ignore the policy statement if the requesting principal is the AdminRole. Using the StringNotLike operator, assert that this SCP is in effect if the principal ARN is not the AdminRole. To do this, fill in the following values for your condition. Select Add condition. The following policy will appear in the edit window. After you validate the policy, select Save. If you already attached the policy in your organization, the changes will immediately take effect. Now, the SCP denies all principals in the account from updating or deleting the AdminRole, except the AdminRole itself. You can now use SCPs to restrict access to specific resources, or define conditions for when SCPs are in effect. You can use the new functionality in your existing SCPs today, or create new permission guardrails for your organization. 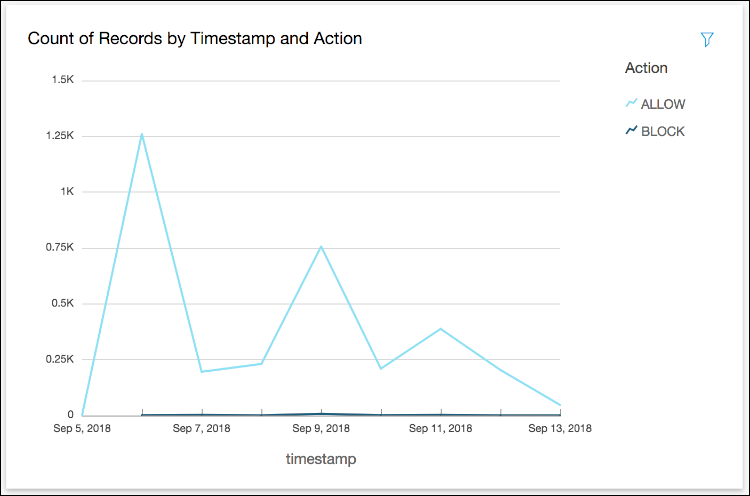 I walked through one example in this blog post, and there are additional use cases for SCPs that you can explore in the documentation. Below are a few that we have heard from customers that you may want to look at. 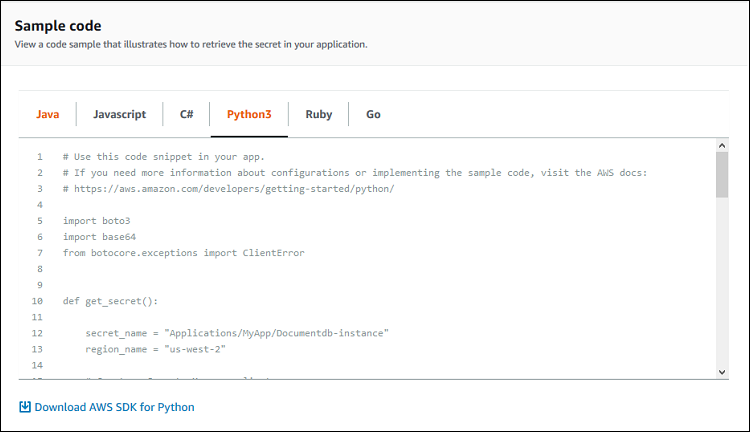 You can start applying SCPs using the AWS Organizations console, CLI, or API. See the Service Control Policies Documentation or the AWS Organizations Forums for more information about SCPs, how to use them in your organization, and additional examples. Mike is the product manager for the Identity and Access Management service at AWS. He enjoys working directly with customers to identify solutions to their challenges, and using data-driven decision making to drive his work. Outside of work, Mike is an avid cyclist and outdoorsperson. He holds a master’s degree in computational mathematics from the University of Washington. Leading up to the AWS Santa Clara Summit, we’re sharing our conversation with Nathan Case, who will be presenting at the event, so you can learn more about him and some of the interesting work that he’s doing. I’ve been with AWS for three years, and I’m a Senior Security Specialist, Solutions Architect. I started out working on our Commercial Sector team, but I moved fairly quickly to Public Sector, where I was the tech lead for our work with the U.S. Department of Defense (DOD) and the first consultant in our U.S. DOD practice. I was offered a position back on the commercial side of the company, which entailed building out how we, as AWS, think about incident response and threat detection. I took that job because it was way too interesting to pass up, and it gave me an opportunity to have more impact for our customers. 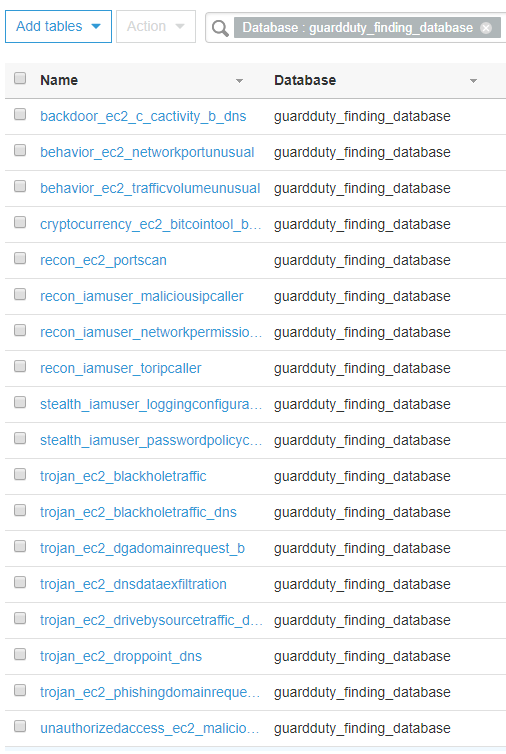 I love doing incident response and threat detection, so I had that moment where I thought, “Really? You’re going to pay me to do this?” I couldn’t turn it down. It did break my heart a little to step away from the public sector, but it’s great getting to work more intimately with some of our commercial customers. What do you wish more people understood about incident response? Because of my role, I generally talk with customers after one of their applications has been breached or something has been broken into. The thing I wish more people knew is that it will be okay. This happens to a lot of people, and it’s not the end of the world. Life will go on. That said, the process does work much better if you call me before an incident happens. Prevention is so much better than the cure. I’m happy to help during an incident, but there are lots of ways we can proactively make things better. I think people like myself, who enjoy incident response, have a slight hero complex: You get to jump in, get involved, and make a difference for somebody. I love walking away from an engagement where something bad has happened, knowing that I’ve made a difference for that person and they’re now a happy customer again. I also enjoy getting to do the pre-work sessions. While I have to make sure that customers understand that security is something they have to do, I help them reach the point where they’re happy about that fact. I get to help them realize that it’s something they’re capable of doing and it’s not as scary as they thought. It’s that moment when I get the call—maybe in the middle of the night—and somebody says this thing has just happened, and can I help them? The hardest aspect of that conversation is working through the event with the CISO or the individual who’s in charge of the response and convincing them that all the steps they’ll need to take will still be there tomorrow and that there’s nothing else they can do in the moment. It’s difficult to watch the pain that accompanies that realization. There’s eventually a certain catharsis at the end of the conversation, as the customer starts to see the light at the end of the tunnel and to understand that everything is going to be all right. But that first moment, when the pit has dropped out of someone’s stomach and I have to watch it on their face—that’s hard. What’s the most common misperception about cloud security that you encounter? I think the misconception still exists that it’s easier to protect a data center than the cloud. But frankly, I wouldn’t be doing this job if I thought data centers were more secure. They’re not. There are so many more things that you can see and take care of in a cloud environment. 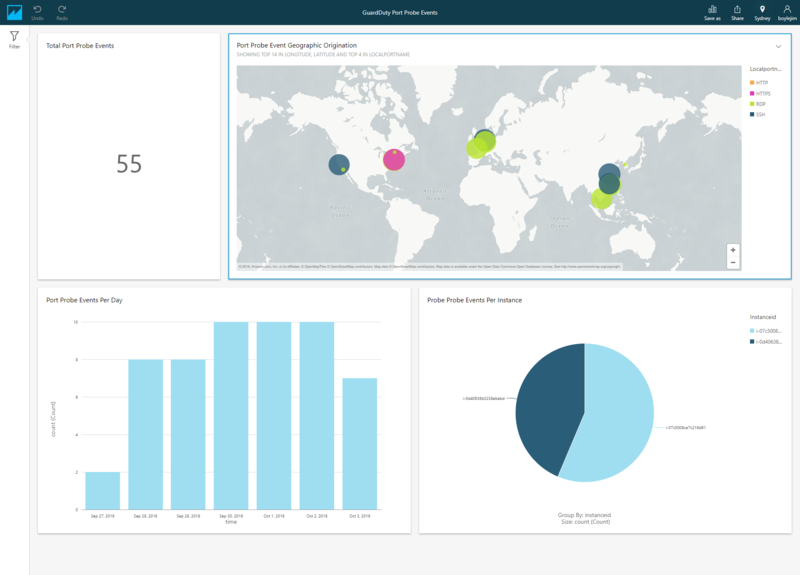 You’re able to detect more threats than you could in a data center, and there’s so much more instrumentation to enable you to keep track of all of those threats. I view my current role as a statement of my belief in cloud security; it’s a way for me to offer help to a large number of people. When I worked for the U.S. Department of Defense, through AWS, it was really important to me to help protect the country and to make sure that we were safe. That’s still really important to me—and I believe the cloud can help achieve that. If you look at the world as a whole, I think there’s evidence of a nefarious substructure that operates in a manner similar to organized crime: It exists, but it’s hopefully not something that most people have to see or interact with. I feel a certain calling to be one of the individuals that helps shield others from these influences that they generally wouldn’t have the knowledge to protect themselves against. For example, I’ve done work that helps protect people from attacks by nation states. It’s very satisfying to be able to help defend and protect customers from things like that. Five years from now, what changes do you think we’ll see across the cloud security landscape? I think that cloud security will begin shifting toward the question, “How did you implement? Is your architecture correct?” Right now, I hear this statement a lot: “We built this application like we have for the last [X] years. It’s fine!” And I believe that attitude will disappear as it becomes painfully obvious that it’s not fine, and it wasn’t fine. The way we architect and build and secure applications will change dramatically. Security will be included to begin with, and designing for failure will become the norm. We’ll see more people building security and detection in layers so that attackers’ actions can be seen and responded to automatically. With the services that are coming into being now, the options for new applications are just so different. It’s very exciting to see what they are and how we can secure applications and infrastructure. You’re hosting a session at the Santa Clara summit titled “Threat detection and mitigation at AWS.” Where did the idea for this topic come from? My talk focuses on describing how you need to architect your environment so that you’re able to see a threat when it’s present. This enables you to know that there’s an issue in advance, rather than finding out two and half years later that a threat has been present all along and you just didn’t know about it. That’s an untenable scenario to me. If we begin to follow appropriate cloud hygiene, then that risk goes way down. What are some of the most common challenges customers face when it comes to threat detection in the cloud? I often see customers struggling to let go of the idea that a human has to touch production to make it work correctly. I think you can trace this back to the fact that people are used to having a rack down in the basement that they can go play with. As humans, we get locked in this “we’re used to it” concept. Change is scary! Technology is evolving and people need to change with it and move forward along the technical path. There are so many opportunities out there for someone who takes the time to learn about new technologies. What are you hoping your audience will do differently as a result of your session? Let me use sailing a boat as an example: If you don’t have a complex navigation system and you can’t tell exactly which course you’re on, there are times when you pick something off in the distance and steer toward that. You’ll probably have to correct course as you go. If the wind blows heavily, you might have to swing left or right before making your way back to your original course. But you have something to steer toward. I hope that my topic gives people that end-point, that place in the distance to travel toward. I don’t think the talk will make everyone suddenly jump up and take action—although it would be great if that happens! But I’d settle for the realization that, “Gee, wouldn’t it be nice if we could get to the place Nathan is talking about?” Simply figuring out what to steer toward is the obstacle standing in the way of a lot of people. You’re known for your excellent BBQ. Can you give us some tips on cooking a great brisket? 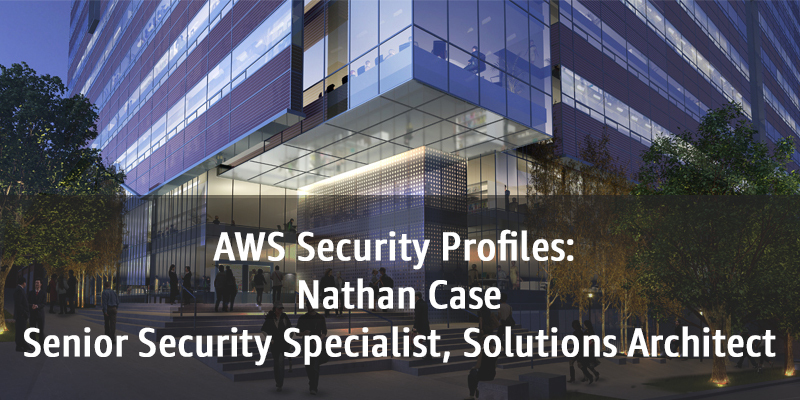 Nathan is a Senior Security Specialist, Solutions Architect. 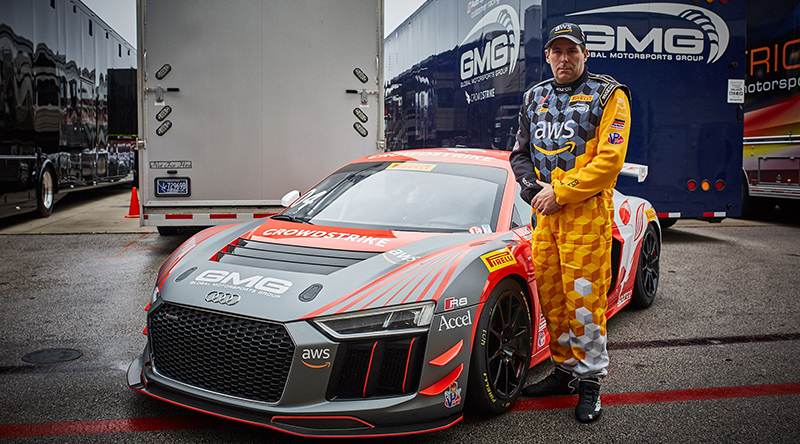 He joined AWS in 2016. The AWS Cloud spans 61 Availability Zones within 20 geographic regions around the world, and has announced plans to expand to 12 more Availability Zones and four more Regions: Hong Kong, Bahrain, Cape Town, and Milan. Customers have told us that they want an easier way to control the Regions where their AWS accounts operate. Based on this feedback, AWS is changing the default behavior for these four and all future Regions so customers will opt in the accounts they want to operate in each new Region. For new AWS Regions, Identity and Access Management (IAM) resources such as users and roles will only be propagated to the Regions that you enable. 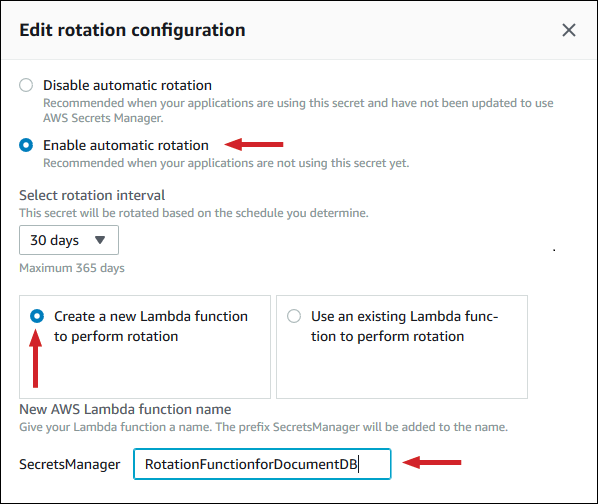 When the next Region launches, you can enable this Region for your account using the AWS Regions setting under My Account in the AWS Management Console. 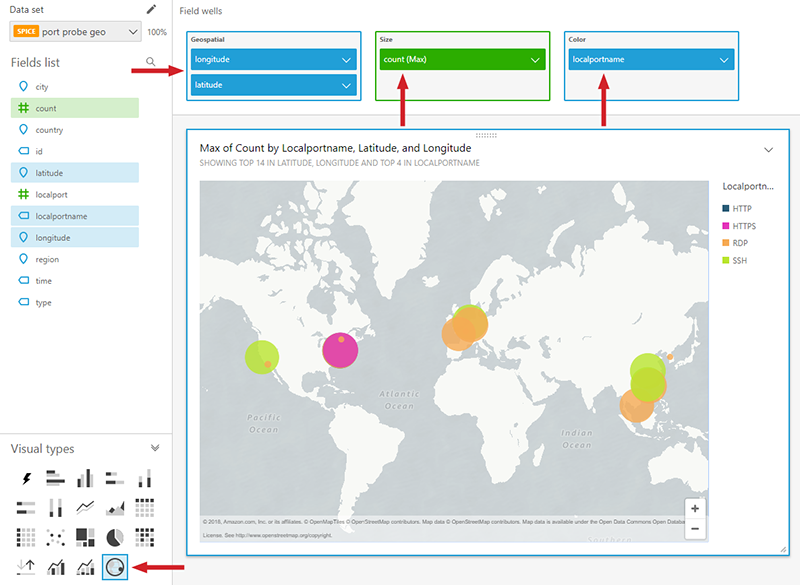 You will need to enable a new Region for your account before you can create and manage resources in that Region. At this time, there are no changes to existing AWS Regions. 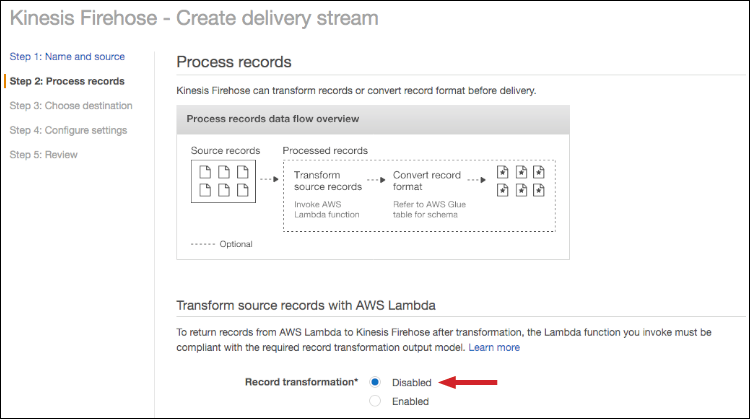 We recommend that you review who in your account will have access to enable and disable AWS Regions. 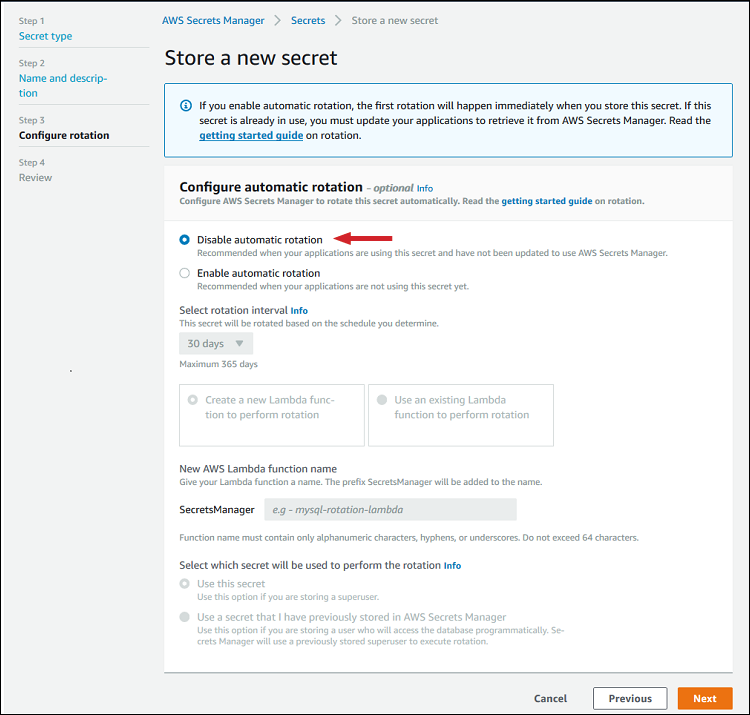 Additionally, you can prepare for this change by setting permissions so that only approved account administrators can enable and disable AWS Regions. Starting today, you can use IAM permissions policies to control which IAM principals (users and roles) can perform these actions. 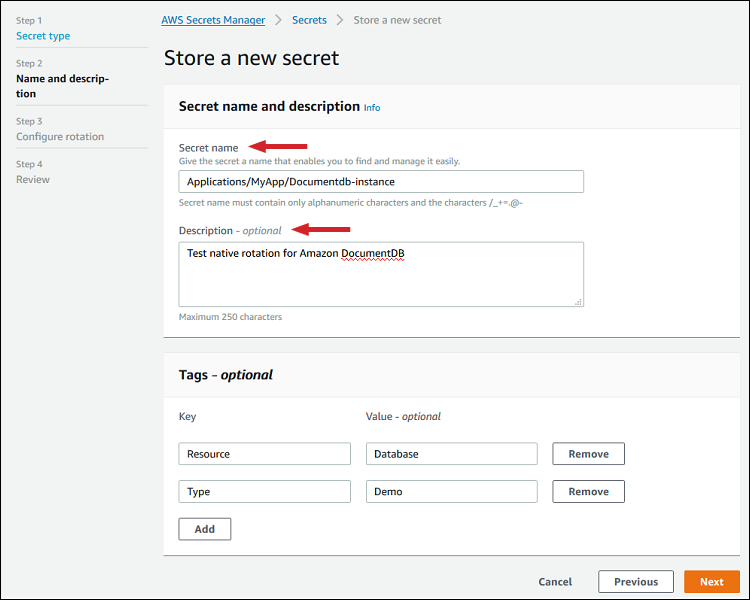 In this post, I describe the new account permissions for enabling and disabling new AWS Regions. I also describe the updates we’ve made to deny these permissions in the AWS-managed PowerUserAccess policy that many customers use to restrict access to administrative actions. For customers who use custom policies to manage administrative access, I show how to secure access to enable and disable new AWS Regions using IAM permissions policies and Service Control Policies in AWS Organizations. Finally, I explain the compatibility of Security Token Service (STS) session tokens with Regions. 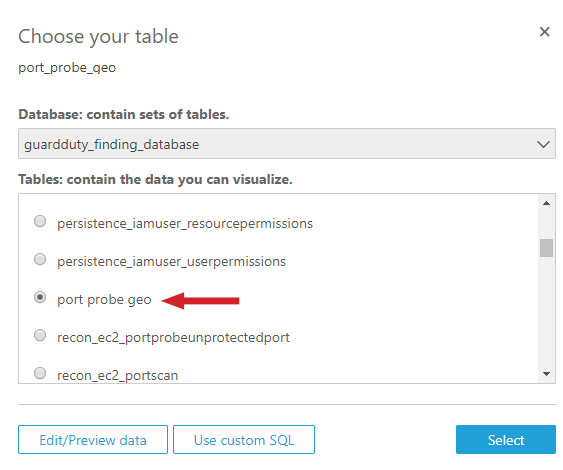 account:EnableRegion Allows you to opt in an account to a new AWS Region (for Regions launched after March 20, 2019). 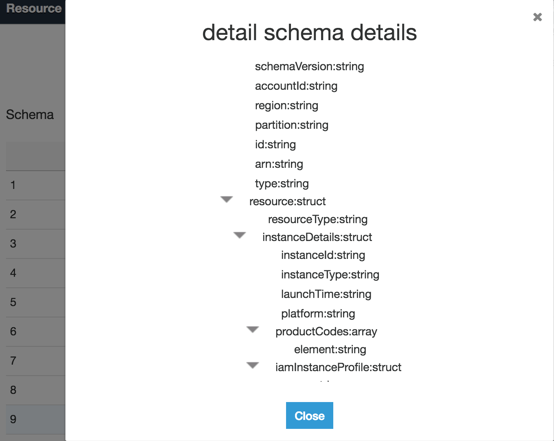 This action propagates your IAM resources such as users and roles to the Region. 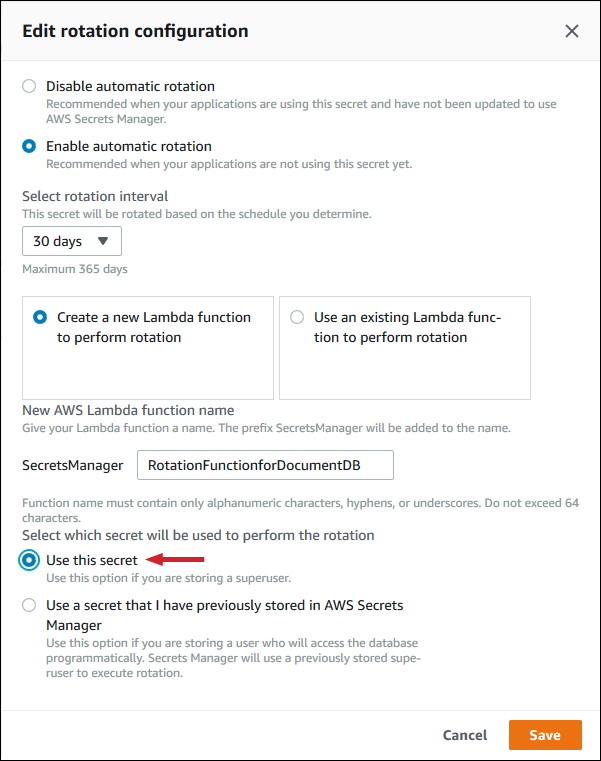 account:DisableRegion Allows you to opt out an account from a new AWS Region (for Regions launched after March 20, 2019). 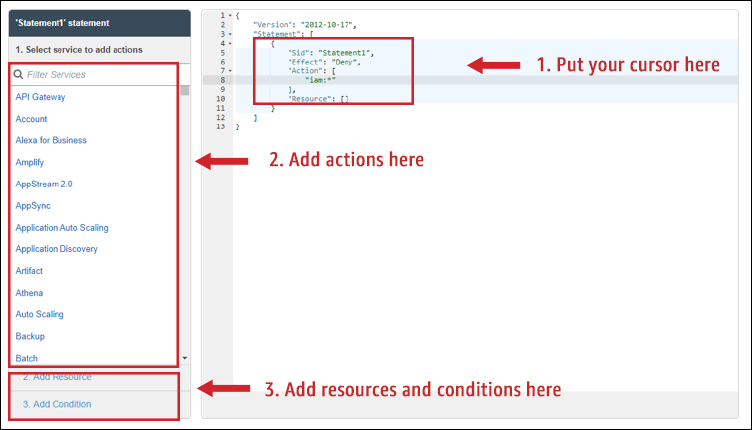 This action removes your IAM resources such as users and roles from the Region. 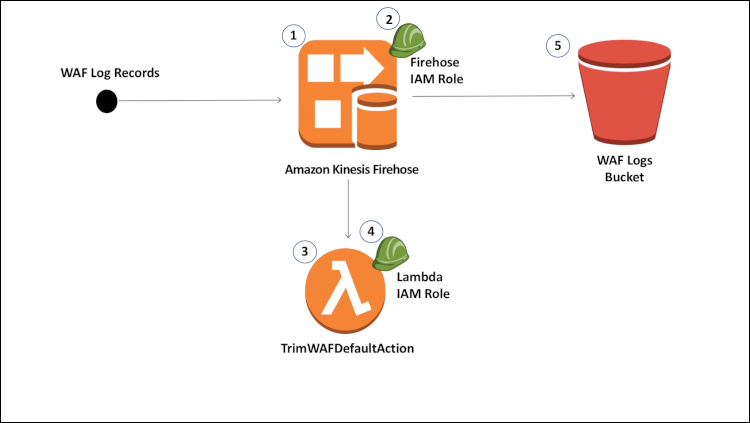 When granting permissions using IAM policies, some administrators may have granted full access to AWS services except for administrative services such as IAM and Organizations. These IAM principals will automatically get access to the new administrative actions in your account to enable and disable AWS Regions. If you prefer not to provide account permissions to enable or disable AWS Regions to these principals, we recommend that you add a statement to your policies to deny access to account permissions. To do this, you can add a deny statement for account:*. As new Regions launch, you will be able to specify the Regions where these permissions are granted or denied. 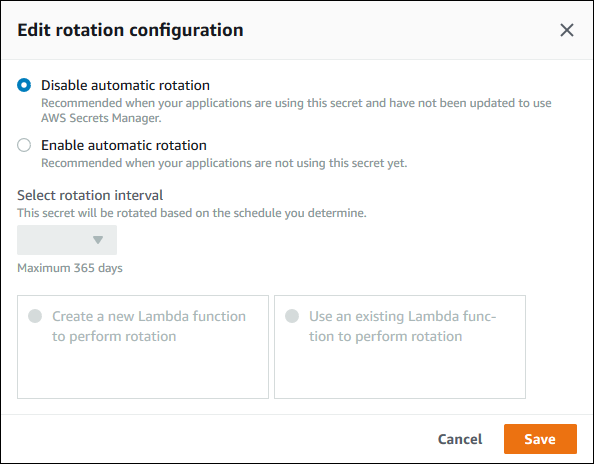 At this time, the account actions to enable and disable AWS Regions apply to all upcoming AWS Regions launched after March 20, 2019. To learn more about managing access to existing AWS Regions, review my post, Easier way to control access to AWS regions using IAM policies. If you’re using the AWS managed PowerUserAccess policy to grant permissions to AWS services without granting access to administrative actions for IAM and Organizations, we have updated this policy as shown below to exclude access to account actions to enable and disable new AWS Regions. You do not need to take further action to restrict these actions for any IAM principals for which this policy applies. We updated the first policy statement, which now allows access to all existing and future AWS service actions except for IAM, AWS Organizations, and account. We also updated the second policy statement to allow the read-only action for listing Regions. The rest of the policy remains unchanged. You can also centrally restrict access to enable and disable Regions for all principals across all accounts in AWS Organizations using Service Control Policies (SCPs). You would use SCPs to restrict this access if you do not anticipate using new Regions. SCPs enable administrators to set permission guardrails that apply to accounts in your organization or an organization unit. To learn more about SCPs and how to create and attach them, read About Service Control Policies. Next, I show how to restrict the Region enable and disable actions for accounts in an AWS organization using an SCP. In the policy below, I explicitly deny using the Effect block of the policy statement. In the Action block, you add the new permissions account:EnableRegion and account:DisableRegion. Once you create the policy, you can attach this policy to the root of your organization. This will restrict permissions across all accounts in your organization. You can use the IAM Policy Simulator to check if any IAM principal in your account has access to the new account actions for enabling and disabling Regions. The simulator evaluates the policies that you choose for a user or role and determines the effective permissions for each of the actions that you specify. Learn more about using the IAM Policy Simulator. For new AWS Regions, we’re also changing region compatibility for session tokens from the AWS Security Token Service (STS) global endpoint. As a best practice, we recommend using the regional STS endpoints to reduce latency. If you’re using regional STS endpoints or don’t plan to operate in new AWS Regions, then the following change doesn’t apply to you and no action is required. If you’re using the global STS endpoint (https://sts.amazonaws.com) for session tokens and plan to operate in new AWS Regions, the session token size is going to increase. This may impact functionality if you store session tokens in any of your systems. To ensure your systems work with this change, we recommend that you update your existing systems to use regional STS endpoints using the AWS SDK. 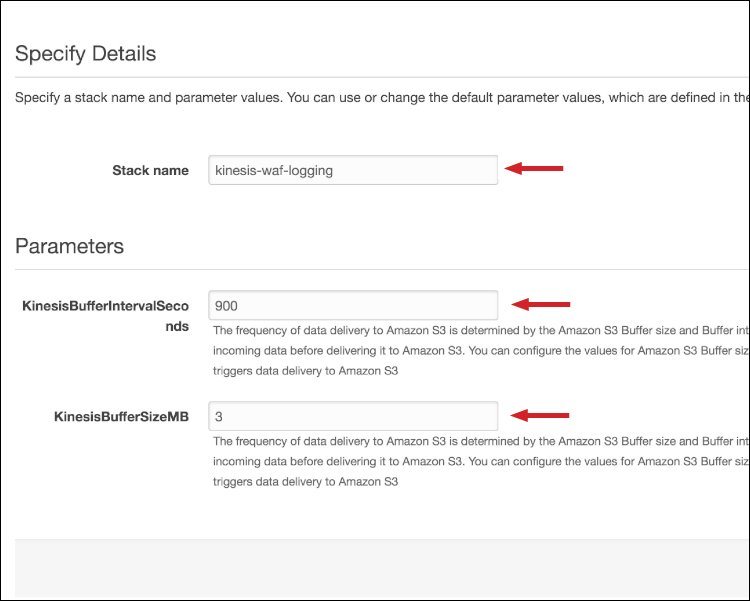 AWS is changing the default behavior for all new Regions going forward. For new AWS Regions, you will opt in to enable your account to operate in those Regions. 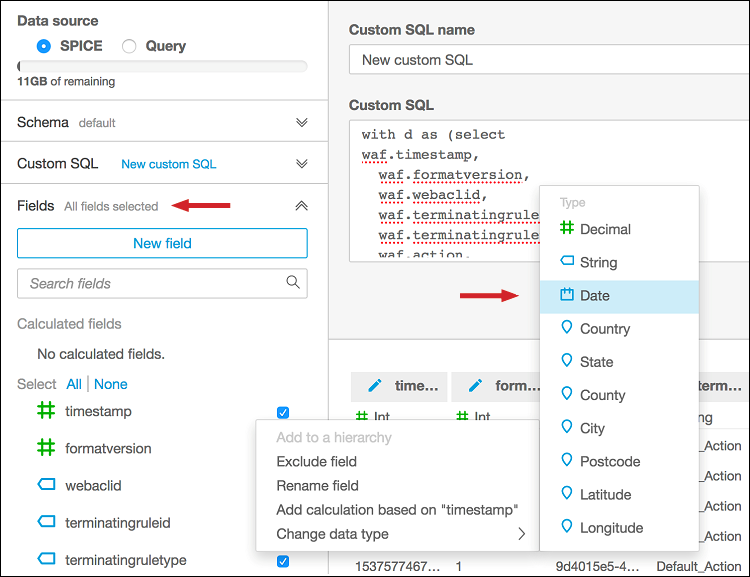 This makes it easier for you to select the regions where you can create and manage AWS resources. To prepare for upcoming Region launches, we recommend that you validate the capability to enable and disable AWS Regions to ensure only approved IAM principals can enable and disable AWS Regions for your account. If you have comments about this post, submit them in the Comments section below. 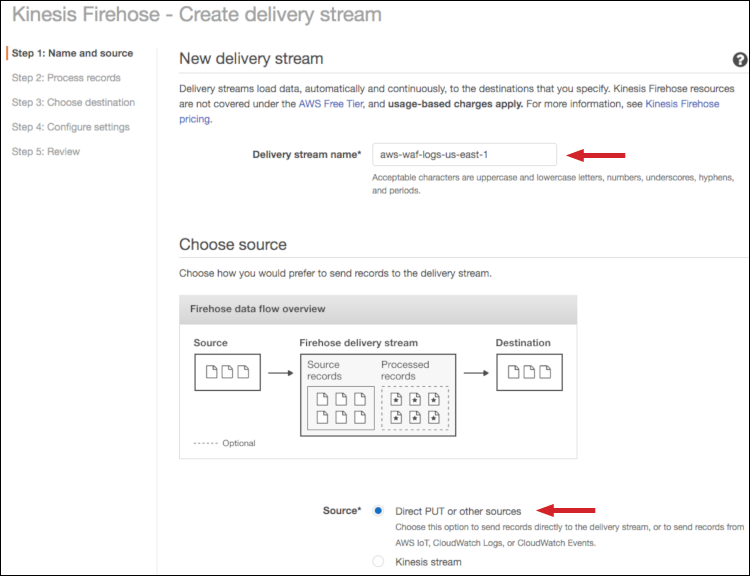 If you have questions about or suggestions for this solution, start a new thread on the AWS forums. Today, many Chief Information Security Officers and cybersecurity practitioners are looking for an effective cybersecurity strategy that will help them achieve measurably better security for their organizations. AWS has released two new whitepapers to help customers plan and implement a strategy that has helped many organizations protect, detect, and respond to modern-day attacks. 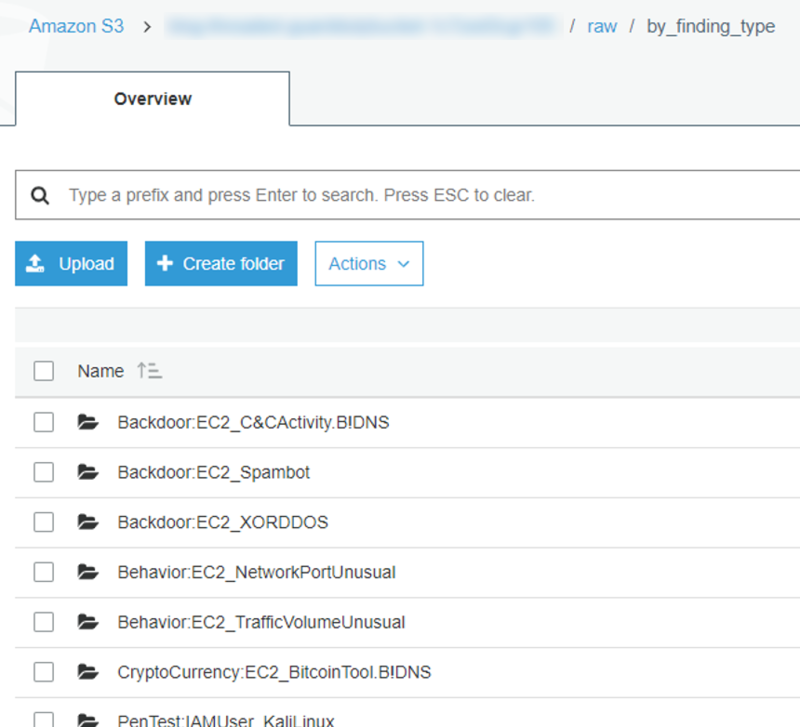 Breaking Intrusion Kill Chains with AWS provides context and shows you, in detail, how to mitigate advanced attackers’ favorite strategies and tactics using the AWS cloud platform. It also offers advice on how to measure the effectiveness of this approach. 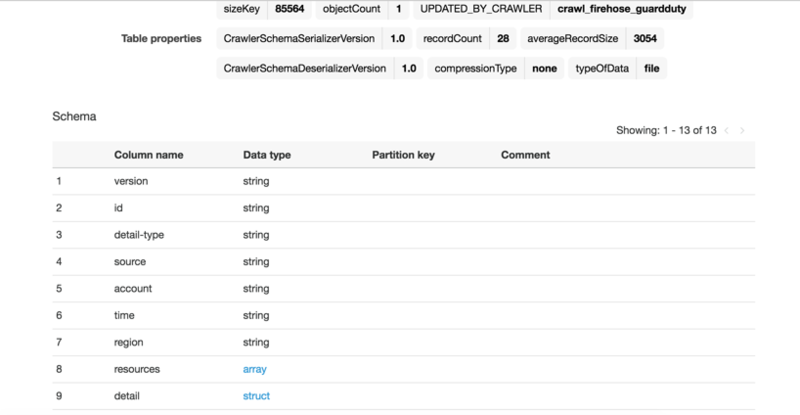 Breaking Intrusion Kill Chains with AWS Reference Material contains a detailed example of how AWS services, features, functionality, and AWS Partner offerings can be used together to safeguard your organization’s data and cloud infrastructure. This paper will save you time and effort by providing you with a comprehensive AWS security control mapping to each phase of advanced attacks, which you’d otherwise have to do on your own. 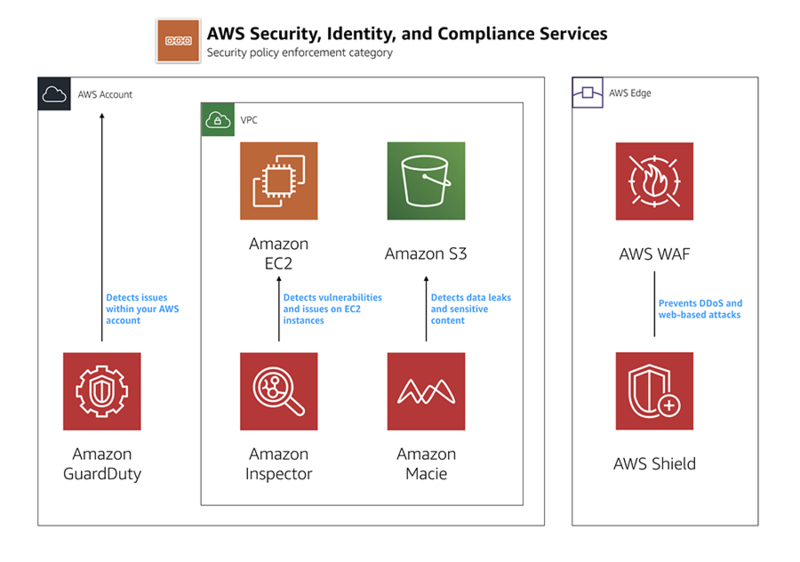 This document provides a list of some of the key AWS security controls, organized in an easy-to-understand format, and it includes a mapping to the AWS Cloud Adoption Framework (CAF). Many organizations use the CAF to build a comprehensive approach to cloud computing across their organization. If your organization uses the CAF, and you decide to implement some or all of the controls described in Breaking Intrusion Kill Chains with AWS, then the reference material in this whitepaper can be used to cross-reference with your other CAF efforts, potentially increasing your ROI. For a high-level introduction, check out my webinar recording. In it, I discuss cybersecurity strategies, explain the framework that’s used, and talk about how to implement it on AWS. Tim is the Regional Leader for Security and Compliance in Europe, Africa, and the Middle East for AWS. He helps federal, regional and local governments, in addition to non-profit organizations, education and health care customers with their security and compliance needs. Tim is a frequent speaker at AWS and industry events. Prior to joining AWS, Tim held a variety of executive-level cybersecurity strategy positions at global companies. The cloud is now at the center of most Enterprise IT strategies. As such, a well-planned move to the cloud can result in immediate business payoff. To achieve such success, it’s important that you adopt Microsoft Active Directory (AD), the foundation of many large enterprise Windows and .NET applications in a secure, scalable, and highly available manner within the AWS Cloud. AWS offers flexible options for running AD, so as a customer it’s essential to select an architecture well-suited to support your applications. AWS offers a fully managed option called AWS Managed Active Directory, which enables your directory-aware workloads to use Managed Active Directory in AWS. You can also run Active Directory on Amazon Elastic Compute Cloud (Amazon EC2) and manage both the EC2 Instances and Active Directory, which provides the flexibility needed to extend an existing Active Directory domain to the AWS infrastructure. In this regard, we are very excited to release Active Directory Domain Services for AWS Whitepaper. This Active Directory whitepaper describes best practices for running Active Directory on AWS, including different architectural approaches for running AWS Managed AD and Active Directory on EC2 Instances. In addition, this document discusses the design considerations, security, network connectivity, and multi-region deployment of Active Directory for both scenarios. 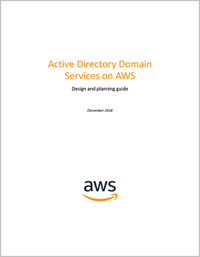 Read the whitepaper: Active Directory on AWS. Vinod Madabushi is an Enterprise Solutions Architect and subject matter expert in Microsoft technologies, including Active Directory. He works with customers on building highly available, scalable, and resilient applications on AWS Cloud. 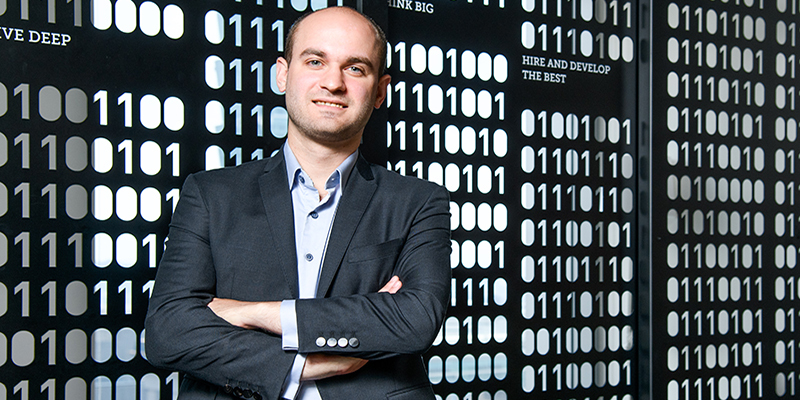 He’s passionate about solving technology challenges and helping customers with their cloud journey. In late November, I announced AWS re:Inforce, a standalone conference where we will deep dive into the latest approaches to security, identity, and risk management utilizing AWS services, features, and tools. Now, after months of planning, the time has arrived to open registration! Ticket sales begin on March 12th at 10:00am PDT, and you can access the ticket sales website here. We do expect to sell out, so please consider registering soon to also secure a hotel (as well as take advantage of our travel discounts). In celebration, we are offering a limited, while supplies last, $300 discount on the full conference ticket price of $1,099. Register with code RFSAL19 to take advantage of this limited offer. The benefits of attending AWS re:Inforce 2019 are considerable. The conference will be built around gaining hands-on tactical knowledge of cloud security, identity, and compliance. Over 100 security-specific AWS Partners will be featured in our learning hub to help you tackle all manner of security concerns. Additionally, we’ll have bootcamps where you can meet with likeminded professionals to learn skills that are applicable to your individual job scope. More details about specific session offerings will be announced in the next few weeks, but you can already find details on the track types and session levels here. Taking a step back for a moment, creating a conference focused on cloud security was important to AWS because, as we’ve often stated, security is job zero for us. While re:Invent is a great opportunity to check in yearly with customers on our new features and services, we felt a conference tailored specifically to cloud security & identity professionals offered a great opportunity for everyone to strengthen their own security program from the ground up. We’ll have four tracks, geared for those just starting out all the way up to next generation aspirational security. We want to be at the forefront of an industry shift from reactive to proactive security, and our inaugural re:Inforce gathering is a great chance for us to hear from customers about their real-world concerns, from encryption to resiliency. We also think building an ongoing community of security stakeholders is critical—we know that excellent guidance for customers doesn’t always come directly from AWS. It can also spring forth from peer conversations and networking opportunities. The strength of the AWS cloud is customers. Our customers see use cases every day that both inform our security roadmap and make our cloud stronger for everyone. Simply put, there is no AWS security story without the tremendous diligence of customers and partners. Creating a space where all parties can come together to exchange knowledge and ideas, whether in a formal session or at a casual dinner, was at the forefront of our thinking when we first considered launching re:Inforce. 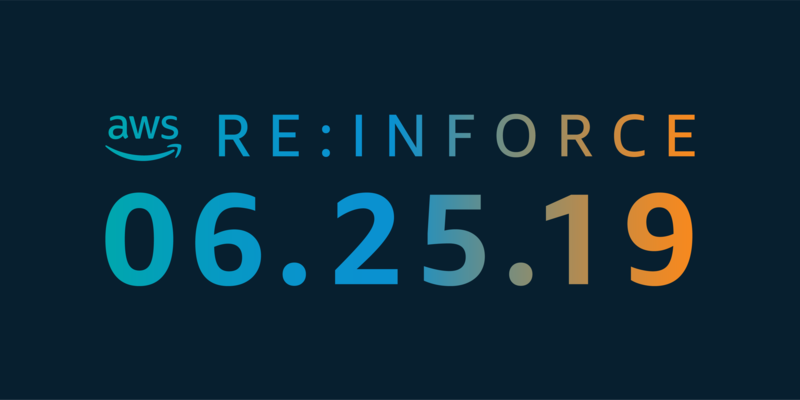 Seeing the threads and details come together on this re:Inforce has been personally exciting and professionally validating; I can’t wait to see you all there in late June. Purchase tickets for AWS re:Inforce via the ticket sales website here. Steve is Vice President and Chief Information Security Officer for AWS. His duties include leading product design, management, and engineering development efforts focused on bringing the competitive, economic, and security benefits of cloud computing to business and government customers. Prior to AWS, he had an extensive career at the Federal Bureau of Investigation, where he served as a senior executive and section chief. He currently holds five patents in the field of cloud security architecture. At AWS, the security, privacy, and protection of customer data always comes first, which is why I am pleased to share the news that AWS has achieved “Hébergeur de Données de Santé” (HDS) certification. With HDS certification, customers and partners who host French Personal Health Information (PHI) are now able to use AWS services to store and process personal health data. The HDS certificate for AWS can be found in AWS Artifact. Introduced by the French governmental agency for health, “Agence Française de la Santé Numérique” (ASIP Santé), HDS certification aims to strengthen the security and protection of personal health data. Achieving this certification demonstrates that AWS provides a framework for technical and governance measures to secure and protect personal health data, governed by French law. The HDS certification validates that AWS ensures data confidentiality, integrity, and availability to its customers and partners. AWS worked with Bureau Veritas, an independent third-party auditor, to achieve the certification. By adopting the AWS cloud, hospitals, health insurance companies, researchers, and other organizations processing personal health data, will be able to improve agility and collaboration, increase experimentation, and foster innovation in order to provide the best possible patient care. The HDS certification currently covers two AWS Regions in Europe (Ireland and Frankfurt), and this will be followed by the AWS Region in Paris, which is planned for the second quarter of 2019. HDS certification adds to the list of internationally recognized certifications and attestations of compliance for AWS, which include ISO 27017 for cloud security, ISO 27018 for cloud privacy, SOC 1, SOC 2, SOC 3, and PCI DSS (Level 1). You can learn more about AWS HDS certification and other compliance certifications and accreditations here.